YELLOW SPRINGS, Ohio — One of Ohio’s approved medical marijuana cultivators is ready to make the state a little greener. 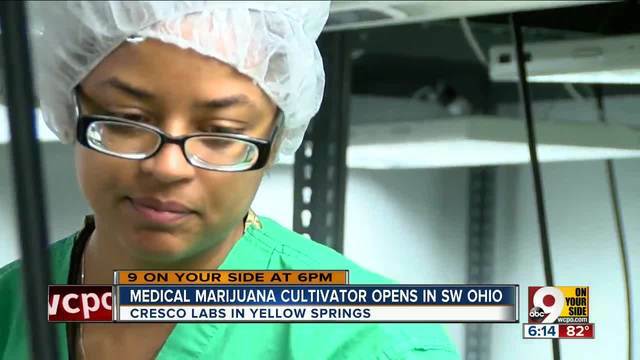 Following a ribbon cutting ceremony Monday, Cresco Labs showed off its crop of plants at its cultivation facility in Yellow Springs, about 70 miles northeast of downtown Cincinnati. CEO Charlie Bachtell said Cresco Labs is fully operational in Ohio, and is ready to provide relief to patients who may benefit from medical marijuana. According to Cresco Labs, its hybrid greenhouse has “an energy efficient design that maximizes the cultivation power of the sun.” The company plans to grow about 30 strains of marijuana to sell at dispensaries across the state in multiple forms including vape pens, oral sprays, pills and transdermal patches. It plans to have products available for purchase at dispensaries in early 2019. The state of Ohio missed its own Sept. 8 deadline for rolling out the medical marijuana program. But progress has been made. About 250 doctors have been certified, including nearly two dozen doctors in the Greater Cincinnati area. Seven Greater Cincinnati medical marijuana dispensaries were granted state licenses by the Ohio Board of Pharmacy. There will soon be 56 regulated dispensaries selling the newly approved drug across the state. Cresco Labs, one of 25 cultivation sites, was awarded a certificate to operate from the state three weeks ago. Despite the delay, Bachtell praised the launch of the program. “It’s not only a new program but still a relatively new industry and they are being very thorough in making sure everything is done right, which will ultimately benefit the patients,” he said. There are 21 medical conditions which can qualify a patient for medical marijuana in Ohio. A doctor has to take a two-hour state-approved training course and then apply to be certified with Ohio’s Medical Board in order to recommend medical marijuana. Patients still won’t be allowed to smoke marijuana. The state’s dispensaries can distribute marijuana in the form of edibles, oils, patches and for vaporizing to patients. The patients and their caregivers can possess as much as a 90-day supply at any given time.